Life has been pretty busy for us since we moved to Austin since we said "yes!" to moving to Dallas, Texas back in summer of 2015, while 7 months pregnant with our first child. But if I really stop to think about it, I think the busyness really started in 2013 right after I graduated with my undergrad. That spring I was taking a heavy load so I could graduate in May, then we immediately started training for our first marathon, and we got engaged in October. It's almost like the speed at which life moved just got faster and faster since 2013 and its really hard to believe how much change we've undergone in just 4.5 short years. Anyways, I preface this "Instant Pot Challenge" post with a few statements of reminiscing because I realize that I probably don't need to add anymore challenges to my life. And if you read my last post that took a look back at 2017, you may be thinking that I need to take a break from life for a little while, ha. What I DO NEED is a good reason to get excited in the kitchen and a better strategy for meal planning and meal cooking. I've shared before that Brad is the primary cook in our house, but he also works a pretty gruesome (gruesome to me) schedule at the hospital which requires for him to be awake all night long when the rest of the world is sleeping. Regularly it seems, he works this 10hr overnight schedule for 7 or 8 days straight. Brad seems to like it, but I'm sure that getting us a little more organized in our dinner plans will give him more hours to snooze on those days he is working, and quite possibly less stress for me on the days that I pickup the cooking. So, I came up with a brilliant idea! (said no one ever). I've been stalking this Instant Pot craze for a while now and really thinking, "I need one of those things in my life". I say that because I could really get on the band wagon of putting several ingredients in a pot and walking away until the thing beeps DONE. (If you haven't heard of an Instant Pot, I am not going to try and explain what it does.. you just have to google it and trust the millions of other bloggers). Anyways, when I take on new recipes in the kitchen, its usually a disaster that Brad saves me from. And when I do come home from work to cook dinner with a toddler who's hyped up on afternoon snacks, I'm usually stressed out by cutting/steaming broccoli, warming up already cooked rice from the fridge and just plain cooking some chicken on the stove top. Seriously, cooking is not therapeutic for me. It's actually the complete opposite. Throw a toddler into the mix who loves to sit on the counter top (you can thank me for the introduction of that habit) who is IN YOUR FACE while you're chopping veggies and cooking over open fire (apparently Texas likes their natural gas... not really a "thing" in Florida!)... I can easily turn into the evil step mother on the verge of a mental break down. Knife, fire, toddler and soon to be infant are not a good combination for me... while hangry myself. Brad is usually just about waking up to our chaos to save the day, as I am saying "shhhh, daddy is sleeping!" for the tenth time. Okay, maybe I'm overreacting (maybe I'm not), but the idea of one pot holding my main dish to be cooked, excites me. No open flame, no stirring and splashing of hot food or oil AND.... A DELAY START BUTTON? Come on, that sounds like a dream come true. Plus I hear its really a "set it and forget it" kinda appliance! 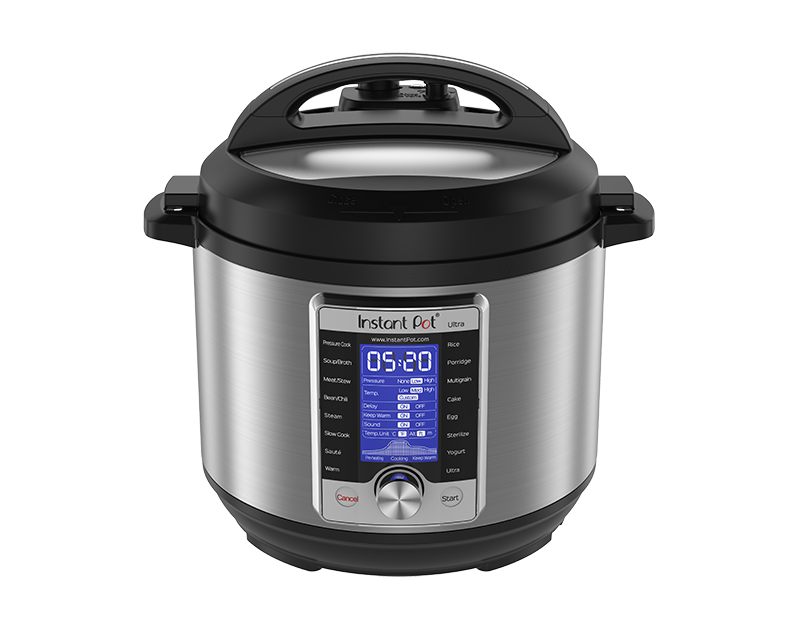 I'll admit, I haven't done a TON of research on all the features this Instant Pot thing has, but I promise that for the first time in my life... I will read the Owners Manual! I pinkie promise (and I hear this is kinda mandatory). I honestly might be hyping this thing up and setting myself up for disappointment. But I cannot imagine that a 9-in-1 pot won't have a positive impact on my life and reduce my stress level in the kitchen ;) My pot arrives just in time for Christmas and with plenty of time for me to tinker around with it before the craziness of the new year begins again. So, I want to challenge myself to cook X number of recipes in this said pot... which I will begin referring to as an InstaPot (that's literally how it sounds in my head every time I want to type out the words, then the little red squiggly line shows up and tells me I typed it wrong. Add To Dictionary? :) ). When I started this blog a few years back, I really wanted to learn "domestic-like skills". And you know what? I can mad-woman clean a house, do some laundry and even iron. But my downfall is always in the kitchen. No one said that I needed to cook over open flame in order to call myself domesticated. So, why have I been trying to convince myself that I need to? If this InstaPot can really bring out Chef Stephanita and help me convince my daughter that I am not that awful in the kitchen, maybe I'll change the name of my blog to Running Away from Domestication. Ha, maybe not... I'm sure then I can focus on some crafty stuff or becoming that awesome PTA mom that I aspire (and have minimal skill set) to be. So, follow along with me! I can't promise I'll share my experience every week on the blog. But I will promise that I'm going to give this thing a real, honest effort. But, I haven't decided how many new recipes I should try to tackle in 2018... any suggestions?